For close-in work and general shooting, it's tough to beat a quality Red Dot Sight. 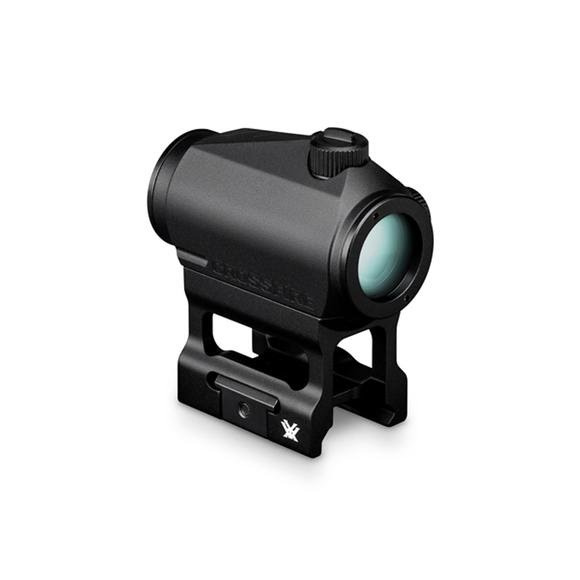 The super-light, ultracompact, insanely-fast-on-target, incredibly durable Vortex Crossfire Red Dot is exactly that. Not only does this sight absolutely rock, it does so at a price that's hotter than a $2 pistol. For close-in work and general shooting, it&apos;s tough to beat a quality Red Dot Sight. The super-light, ultracompact, insanely-fast-on-target, incredibly durable Vortex Crossfire Red Dot is exactly that. Not only does this sight absolutely rock, it does so at a price that&apos;s hotter than a $2 pistol. The daylight-bright, 2-MOA dot, is easy to acquire and promotes rapid engagement of targets, yet is fine enough to more precisely engage targets at distance. 11 intensity levels of brightness let shooters cater the dot intensity to the situation at hand. Skeletonized mount offers two height options (Low and Lower 1/3 Co-Witness), lending its functionality to AR-15s, shotguns, and pistols. All red dot and holographic sights will exhibit some small amount of parallax. Matching current industry practice, this small amount would be considered parallax free and will make a negligible difference in the Crossfire&apos;s performance. Offers two mounting-height options: Low and Lower 1/3 Co-Witness.